120,000 people attended an anti-nuclear protest in Bonn, West Germany, on 14 October 1979, following the Three Mile Island accident. The anti-nuclear movement is a social movement that opposes various nuclear technologies. Some direct action groups, environmental movements, and professional organisations have identified themselves with the movement at the local, national, or international level. Major anti-nuclear groups include Campaign for Nuclear Disarmament, Friends of the Earth, Greenpeace, International Physicians for the Prevention of Nuclear War, Peace Action and the Nuclear Information and Resource Service. The initial objective of the movement was nuclear disarmament, though since the late 1960s opposition has included the use of nuclear power. Many anti-nuclear groups oppose both nuclear power and nuclear weapons. The formation of green parties in the 1970s and 1980s was often a direct result of anti-nuclear politics. Some local opposition to nuclear power emerged in the early 1960s, and in the late 1960s some members of the scientific community began to express their concerns. In the early 1970s, there were large protests about a proposed nuclear power plant in Wyhl, West Germany. The project was cancelled in 1975 and anti-nuclear success at Wyhl inspired opposition to nuclear power in other parts of Europe and North America. Nuclear power became an issue of major public protest in the 1970s and while opposition to nuclear power continues, increasing public support for nuclear power has re-emerged over the last decade in light of growing awareness of global warming and renewed interest in all types of clean energy (see the Pro-nuclear movement). For many years after the 1986 Chernobyl disaster nuclear power was off the policy agenda in most countries, and the anti-nuclear power movement seemed to have won its case. Some anti-nuclear groups disbanded. In the 2000s (decade), however, following public relations activities by the nuclear industry, advances in nuclear reactor designs, and concerns about climate change, nuclear power issues came back into energy policy discussions in some countries. The 2011 Japanese nuclear accidents subsequently undermined the nuclear power industry's proposed renaissance and revived nuclear opposition worldwide, putting governments on the defensive. As of 2016, countries such as Australia, Austria, Denmark, Greece, Malaysia, New Zealand, and Norway have no nuclear power stations and remain opposed to nuclear power. Germany, Italy, Spain, and Switzerland are phasing-out nuclear power. Sweden formerly had a nuclear phase-out policy, aiming to end nuclear power generation in Sweden by 2010. On 5 February 2009, the Government of Sweden announced an agreement allowing for the replacement of existing reactors, effectively ending the phase-out policy. Globally, more nuclear power reactors have closed than opened in recent years. The application of nuclear technology, as a source of energy and as an instrument of war, has been controversial. These issues are discussed in nuclear weapons debate, nuclear power debate, and uranium mining debate. Scientists and diplomats have debated nuclear weapons policy since before the Atomic bombings of Hiroshima and Nagasaki in 1945. The public became concerned about nuclear weapons testing from about 1954, following extensive nuclear testing in the Pacific. 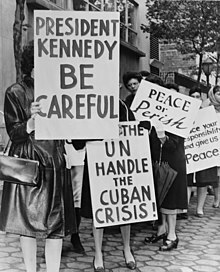 In 1961, at the height of the Cold War, about 50,000 women brought together by Women Strike for Peace marched in 60 cities in the United States to demonstrate against nuclear weapons. 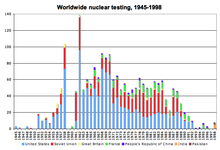 In 1963, many countries ratified the Partial Test Ban Treaty which prohibited atmospheric nuclear testing. The 18,000 km2 expanse of the Semipalatinsk Test Site (indicated in red), which covers an area the size of Wales. The Soviet Union conducted 456 nuclear tests at Semipalatinsk from 1949 until 1989 with little regard for their effect on the local people or environment. The full impact of radiation exposure was hidden for many years by Soviet authorities and has only come to light since the test site closed in 1991. From an anti-nuclear point of view, there is a threat to modern civilization from global nuclear war by accidental or deliberate nuclear strike. Some climate scientists estimate that a war between two countries that resulted in 100 Hiroshima-size atomic explosions would cause significant loss of life, in the tens of millions from climatic effects alone and disabled future generation . Soot thrown up into the atmosphere could blanket the earth, causing food chain disruption in what is termed a nuclear winter. Many anti-nuclear weapons groups cite the 1996 Advisory Opinion of the International Court of Justice, Legality of the Threat or Use of Nuclear Weapons, in which it found that 'the threat or use of nuclear weapons would generally be contrary to the rules of international law applicable in armed conflict'. Ridding the world of nuclear weapons has been a cause for pacifists for decades. But more recently mainstream politicians and retired military leaders have advocated nuclear disarmament. In January 2007 an article in The Wall Street Journal, authored by Henry Kissinger, Bill Perry, George Shultz and Sam Nunn. These men were veterans of the cold-war who believed in using nuclear weapons for deterrence. But they now reversed their previous position and asserted that instead of making the world safer, nuclear weapons had become a source of extreme concern. Since the 1970s, some countries have built their own second-strike capability of massive deterrence in the event of a military attack with weapons of mass destruction. Two examples of this second-strike capability are the Samson Option strategy of Israel, and the Dead Hand system of Russia. During the era of nuclear weapons testing many local communities were affected, and some are still affected by uranium mining, and radioactive waste disposal. There are large variations in peoples’ understanding of the issues surrounding nuclear power, including the technology itself, its deployment, climate change, and energy security. There is a wide spectrum of views and concerns over nuclear power and it remains a controversial area of public policy. Of these concerns, nuclear accidents and disposal of long-lived radioactive waste have probably had the greatest public impact worldwide. Anti-nuclear campaigners point to the 2011 Fukushima nuclear emergency as proof that nuclear power can never be 100% safe. In his book Global Fission: The Battle Over Nuclear Power, Jim Falk explores connections between technological concerns and political concerns. Falk suggests that concerns of citizen groups or individuals who oppose nuclear power have often focused initially on the "range of physical hazards which accompany the technology" and leads to a "concern over the political relations of the nuclear industry" A more neutral observer might observe that this is nothing more than a conspiracy theory. Baruch Fischhoff, a social science professor said that many people really do not trust the nuclear industry. Wade Allison, a physics professor actually says "radiation is safe & all nations should embrace nuclear technology"
M.V. Ramana says that "distrust of the social institutions that manage nuclear energy is widespread", and a 2001 survey by the European Commission found that "only 10.1 percent of Europeans trusted the nuclear industry". This public distrust is periodically reinforced by nuclear safety violations, or through ineffectiveness or corruption of the nuclear regulatory authorities. Once lost, says Ramana, trust is extremely difficult to regain. Faced with public antipathy, the nuclear industry has "tried a variety of strategies to persuade the public to accept nuclear power", including the publication of numerous "fact sheets" that discuss issues of public concern. M.V. Ramana says that none of these strategies have been very successful. Nuclear proponents have tried to regain public support by offering newer, safer, reactor designs. These designs include those that incorporate passive safety and Small Modular Reactors. While these reactor designs "are intended to inspire trust, they may have an unintended effect: creating distrust of older reactors that lack the touted safety features". Since 2000 the nuclear industry has undertaken an international media and lobbying campaign to promote nuclear power as a solution to the greenhouse effect and climate change. Nuclear power, the industry says, emits no or negligible amounts of carbon dioxide. Anti-nuclear groups respond by saying that only reactor operation is free of carbon dioxide emissions. All other stages of the nuclear fuel chain – mining, milling, transport, fuel fabrication, enrichment, reactor construction, decommissioning and waste management – use fossil fuels and hence emit carbon dioxide. In 2011, a French court fined Électricité de France (EDF) €1.5m and jailed two senior employees for spying on Greenpeace, including hacking into Greenpeace's computer systems. Greenpeace was awarded €500,000 in damages. There is a wide range of published energy-related studies which conclude that energy efficiency programs and renewable power technologies are a better energy option than nuclear power plants. This diverse range of studies come from many different sources, across the political spectrum, and from various academic disciplines, which suggests that there is a consensus among many independent, non-partisan energy experts that nuclear power plants are a poor way to produce electrical power. The international nuclear fusion project International Thermonuclear Experimental Reactor (ITER) is constructing the world's largest and most advanced experimental tokamak nuclear fusion reactor in the south of France. A collaboration between the European Union (EU), India, Japan, China, Russia, South Korea and the United States, the project aims to make a transition from experimental studies of plasma physics to electricity-producing fusion power plants. In 2005, Greenpeace International issued a press statement criticizing government funding of the ITER, believing the money should have been diverted to renewable energy sources and claiming that fusion energy would result in nuclear waste and nuclear weapons proliferation issues. A French association including about 700 anti-nuclear groups, Sortir du nucléaire (Get Out of Nuclear Energy), claimed that ITER was a hazard because scientists did not yet know how to manipulate the high-energy deuterium and tritium hydrogen isotopes used in the fusion process. According to most anti-nuclear groups, nuclear fusion power “remains a distant dream”. The World Nuclear Association have said that fusion "presents so far insurmountable scientific and engineering challenges". Construction of the ITER facility began in 2007, but the project has run into many delays and budget overruns. Several milestones of the project has already been finished, but the finishing date for First Plasma has been discussed and postponed many times with various conclusions. In late 2016, the ITER council agreed on an updated project schedule, with a planned First Plasma opening by 2025, nine years after the originally anticipated opening. Some anti-nuclear groups advocate reduced reliance on reactor-produced medical radioisotopes, through the use of alternative radioisotope production and alternative clinical technologies. Cyclotrons are being increasingly used to produce medical radioisotopes to the point where nuclear reactors are no longer needed to make the most common medical isotopes. ...the transition from coal, oil, and gas to wind, solar, and geothermal energy is well under way. In the old economy, energy was produced by burning something — oil, coal, or natural gas — leading to the carbon emissions that have come to define our economy. The new energy economy harnesses the energy in wind, the energy coming from the sun, and heat from within the earth itself. In 2014 global wind power capacity expanded 16% to 369,553 MW. Yearly wind energy production is also growing rapidly and has reached around 4% of worldwide electricity usage, 11.4% in the EU, and it is widely used in Asia, and the United States. In 2014, worldwide installed photovoltaics capacity increased to 177 gigawatts (GW), sufficient to supply 1 percent of global electricity demands. Solar thermal energy stations operate in the United States and Spain, and as of 2016, the largest of these is the 392 MW Ivanpah Solar Electric Generating System in California. The world's largest geothermal power installation is The Geysers in California, with a rated capacity of 750 MW. Brazil has one of the largest renewable energy programs in the world, involving production of ethanol fuel from sugar cane, and ethanol now provides 18% of the country's automotive fuel. Ethanol fuel is also widely available in the United States. Greenpeace advocates a reduction of fossil fuels by 50% by 2050 as well as phasing out nuclear power, contending that innovative technologies can increase energy efficiency, and suggests that by 2050 most electricity will come from renewable sources. The International Energy Agency estimates that nearly 50% of global electricity supplies will need to come from renewable energy sources in order to halve carbon dioxide emissions by 2050 and minimise climate change impacts. Mark Z. Jacobson, a Stanford professor, says producing all new energy with wind power, solar power, and hydropower by 2030 is feasible and existing energy supply arrangements could be replaced by 2050. Barriers to implementing the renewable energy plan are seen to be "primarily social and political, not technological or economic". Jacobson says that energy costs with a wind, solar, water system should be similar to today's energy costs. Many has since referred to Jacobson's work to justify advocating for all 100% renewables, however, in February, 2017, a group of twenty-one scientists published a critique of Jacobson's work and found that his analysis involves "errors, inappropriate methods and implausible assumptions" and failed to provide "credible evidence for rejecting the conclusions of previous analyses that point to the benefits of considering a broad portfolio of energy system options." Anti-nuclear power organisations have emerged in every country that has had a nuclear power programme. Protest movements against nuclear power first emerged in the United States, at the local level, and spread quickly to Europe and the rest of the world. National nuclear campaigns emerged in the late 1970s. Fuelled by the Three Mile Island accident and the Chernobyl disaster, the anti-nuclear power movement mobilised political and economic forces which for some years "made nuclear energy untenable in many countries". In the 1970s and 1980s, the formation of green parties was often a direct result of anti-nuclear politics (e.g., in Germany and Sweden). Some of these anti-nuclear power organisations are reported to have developed considerable expertise on nuclear power and energy issues. In 1992, the chairman of the Nuclear Regulatory Commission said that "his agency had been pushed in the right direction on safety issues because of the pleas and protests of nuclear watchdog groups". European Nuclear Disarmament, which held annual conventions in the 1980s involving thousands of anti-nuclear weapons activists mostly from Western Europe but also from Eastern Europe, the United States, and Australia. Friends of the Earth International, a network of environmental organizations in 77 countries. Since 2014, however, FOE (UK) has softened its stance; the fierce opposition against nuclear reactors has shifted into a more pragmatic opposition, which still opposes the construction of new nuclear (fission) reactors, but doesn't campaign against closing down the existing ones any more. Global Zero, an international non-partisan group of 300 world leaders dedicated to achieving the elimination of nuclear weapons. Greenpeace International, a non-governmental environmental organization with offices in over 41 countries and headquarters in Amsterdam, Netherlands. International Physicians for the Prevention of Nuclear War, which had affiliates in 41 nations in 1985, representing 135,000 physicians; IPPNW was awarded the UNESCO Peace Education Prize in 1984 and the Nobel Peace Prize in 1985. Pax Christi International, a Catholic group which took a "sharply anti-nuclear stand"
The Campaign for Nuclear Disarmament symbol, designed in 1958. It later became a universal peace symbol used in many different versions worldwide. In 1971, the town of Wyhl, in Germany, was a proposed site for a nuclear power station. In the years that followed, public opposition steadily mounted, and there were large protests. Television coverage of police dragging away farmers and their wives helped to turn nuclear power into a major issue. In 1975, an administrative court withdrew the construction licence for the plant. The Wyhl experience encouraged the formation of citizen action groups near other planned nuclear sites. In 1972, the nuclear disarmament movement maintained a presence in the Pacific, largely in response to French nuclear testing there. New Zealand activists sailed boats into the test zone, interrupting the testing program. In Australia, thousands of people joined protest marches in Adelaide, Melbourne, Brisbane, and Sydney. Scientists issued statements demanding an end to the nuclear tests. In Fiji, anti-nuclear activists formed an Against Testing on Mururoa organization. In the Basque Country (Spain and France), a strong anti-nuclear movement emerged in 1973, which ultimately led to the abandonment of most of the planned nuclear power projects. On July 14, 1977, in Bilbao, between 150,000 and 200,000 people protested against the Lemoniz Nuclear Power Plant. This has been called the "biggest ever anti-nuclear demonstration". In France, there were mass protests in the early 1970s, organized at nearly every planned nuclear site in France. Between 1975 and 1977, some 175,000 people protested against nuclear power in ten demonstrations. In 1977 there was a massive demonstration at the Superphénix breeder reactor in Creys-Malvillein which culminated in violence. 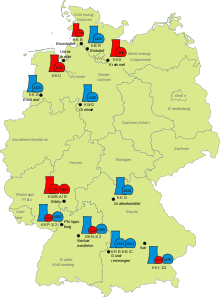 In West Germany, between February 1975 and April 1979, some 280,000 people were involved in seven demonstrations at nuclear sites. Several site occupations were also attempted. Following the Three Mile Island accident in 1979, some 120,000 people attended a demonstration against nuclear power in Bonn. In the Philippines, there were many protests in the late 1970s and 1980s against the proposed Bataan Nuclear Power Plant, which was built but never operated. In 1981, Germany's largest anti-nuclear power demonstration protested against the construction of the Brokdorf Nuclear Power Plant west of Hamburg. Some 100,000 people came face to face with 10,000 police officers. In the late 1970s and early 1980s, the revival of the nuclear arms race, triggered a new wave of protests about nuclear weapons. Older organizations such as the Federation of Atomic Scientists revived, and newer organizations appeared, including the Nuclear Weapons Freeze Campaign and Physicians for Social Responsibility. 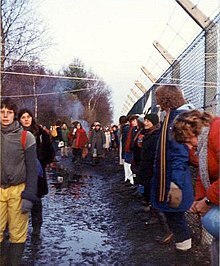 In the UK, on 1 April 1983, about 70,000 people linked arms to form a 14-mile-long human chain between three nuclear weapons centres in Berkshire. On Palm Sunday 1982, 100,000 Australians participated in anti-nuclear rallies in the nation's largest cities. Growing year by year, the rallies drew 350,000 participants in 1985. In May 1986, following the Chernobyl disaster, clashes between anti-nuclear protesters and West German police were common. More than 400 people were injured in mid-May at a nuclear-waste reprocessing plant being built near Wackersdorf. Also in May 1986, an estimated 150,000 to 200,000 people marched in Rome to protest against the Italian nuclear program, and 50,000 marched in Milan. Hundreds of people walked from Los Angeles to Washington, D.C. in 1986 in what is referred to as the Great Peace March for Global Nuclear Disarmament. The march took nine months to traverse 3,700 miles (6,000 km), advancing approximately fifteen miles per day. The anti-nuclear organisation "Nevada Semipalatinsk" was formed in 1989 and was one of the first major anti-nuclear groups in the former Soviet Union. It attracted thousands of people to its protests and campaigns which eventually led to the closure of the nuclear test site in north-east Kazakhstan, in 1991. The World Uranium Hearing was held in Salzburg, Austria in September 1992. Anti-nuclear speakers from all continents, including indigenous speakers and scientists, testified to the health and environmental problems of uranium mining and processing, nuclear power, nuclear weapons, nuclear tests, and radioactive waste disposal. People who spoke at the 1992 Hearing included: Thomas Banyacya, Katsumi Furitsu, Manuel Pino and Floyd Red Crow Westerman. A large anti-nuclear demonstration was held in May 1979 in Washington, D.C., when 65,000 people including the Governor of California, attended a march and rally against nuclear power. In New York City on September 23, 1979, almost 200,000 people attended a protest against nuclear power. Anti-nuclear power protests preceded the shutdown of the Shoreham, Yankee Rowe, Millstone I, Rancho Seco, Maine Yankee, and about a dozen other nuclear power plants. On May 1, 2005, 40,000 anti-nuclear/anti-war protesters marched past the United Nations in New York, 60 years after the atomic bombings of Hiroshima and Nagasaki. This was the largest anti-nuclear rally in the U.S. for several decades. 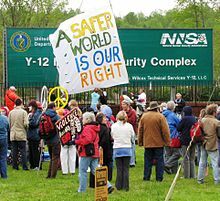 In the 2000s there were protests about, and campaigns against, several new nuclear reactor proposals in the United States. In 2013, four aging, uncompetitive, reactors were permanently closed: San Onofre 2 and 3 in California, Crystal River 3 in Florida, and Kewaunee in Wisconsin. Vermont Yankee, in Vernon, is scheduled to close in 2014, following many protests. Protesters in New York State are seeking to close Indian Point Energy Center, in Buchanan, 30 miles from New York City. For many years after the 1986 Chernobyl disaster nuclear power was off the policy agenda in most countries, and the anti-nuclear power movement seemed to have won its case. Some anti-nuclear groups disbanded. In the 2000s (decade), however, following public relations activities by the nuclear industry, advances in nuclear reactor designs, and concerns about climate change, nuclear power issues came back into energy policy discussions in some countries. The Fukushima Daiichi nuclear disaster subsequently undermined the nuclear power industry's proposed come back. In January 2004, up to 15,000 anti-nuclear protesters marched in Paris against a new generation of nuclear reactors, the European Pressurised Water Reactor (EPWR). On May 1, 2005, 40,000 anti-nuclear/anti-war protesters marched past the United Nations in New York, 60 years after the atomic bombings of Hiroshima and Nagasaki. This was the largest anti-nuclear rally in the U.S. for several decades. In Britain, there were many protests about the government's proposal to replace the aging Trident weapons system with a newer model. The largest protest had 100,000 participants and, according to polls, 59 percent of the public opposed the move. On March 17, 2007 simultaneous protests, organised by Sortir du nucléaire, were staged in five French towns to protest construction of EPR plants; Rennes, Lyon, Toulouse, Lille, and Strasbourg. In June 2007, 4,000 local residents, students and anti-nuclear activists took to the streets in the city of Kudzus in Indonesia's Central Java, calling on the Government to abandon plans to build a nuclear power plant there. In February 2008, a group of concerned scientists and engineers called for the closure of the Kazantzakis-Kariwa Nuclear Power Plant in Japan. The International Conference on Nuclear Disarmament took place in Oslo in February 2008, and was organized by The Government of Norway, the Nuclear Threat Initiative and the Hoover Institute. The Conference was entitled Achieving the Vision of a World Free of Nuclear Weapons and had the purpose of building consensus between nuclear weapon states and non-nuclear weapon states in relation to the Nuclear Non-proliferation Treaty. During a weekend in October 2008, some 15,000 people disrupted the transport of radioactive nuclear waste from France to a dump in Germany. This was one of the largest such protests in many years and, according to Der Spiel, it signals a revival of the anti-nuclear movement in Germany. In 2009, the coalition of green parties in the European parliament, who are unanimous in their anti-nuclear position, increased their presence in the parliament from 5.5% to 7.1% (52 seats). In October 2008 in the United Kingdom, more than 30 people were arrested during one of the largest anti-nuclear protests at the Atomic Weapons Establishment at Aldermaston for 10 years. The demonstration marked the start of the UN World Disarmament Week and involved about 400 people. In 2008 and 2009, there have been protests about, and criticism of, several new nuclear reactor proposals in the United States. There have also been some objections to license renewals for existing nuclear plants. A convoy of 350 farm tractors and 50,000 protesters took part in an anti-nuclear rally in Berlin on September 5, 2009. The marchers demanded that Germany close all nuclear plants by 2020 and close the Gorleben radioactive dump. Gorleben is the focus of the anti-nuclear movement in Germany, which has tried to derail train transports of waste and to destroy or block the approach roads to the site. Two above-ground storage units house 3,500 containers of radioactive sludge and thousands of tonnes of spent fuel rods. On April 21, 2010, a dozen environmental organizations called on the United States Nuclear Regulatory Commission to investigate possible limitations in the AP1000 reactor design. These groups appealed to three federal agencies to suspend the licensing process because they believed containment in the new design is weaker than existing reactors. On April 24, 2010, about 120,000 people built a human chain (KETTENreAKTION!) between the nuclear plants at Krümmel and Brunsbüttel. In this way they were demonstrating against the plans of the German government to extend the life of nuclear power reactors. In May 2010, some 25,000 people, including members of peace organizations and 1945 atomic bomb survivors, marched for about two kilometers from downtown New York to the United Nations headquarters, calling for the elimination of nuclear weapons. In September 2010, German government policy shifted back toward nuclear energy, and this generated some new anti-nuclear sentiment in Berlin and beyond. On September 18, 2010, tens of thousands of Germans surrounded Chancellor Angela Merkel’s office in an anti-nuclear demonstration that organisers said was the biggest of its kind since the 1986 Chernobyl disaster. In October 2010, tens of thousands of people protested in Munich against the nuclear power policy of Angela Merkel's coalition government. The action was the largest anti-nuclear event in Bavaria for more than two decades. In November 2010, there were violent protests against a train carrying reprocessed nuclear waste in Germany. Tens of thousands of protesters gathered in Dannenberg to signal their opposition to the cargo. Around 16,000 police were mobilised to deal with the protests. In December 2010, some 10,000 people (mainly fishermen, farmers and their families) turned out to oppose the Jaitapur Nuclear Power Project in the Maharashtra state of India, amid a heavy police presence. 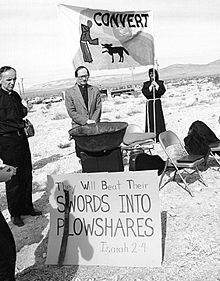 In December 2010, five anti-nuclear weapons activists, including octogenarians and Jesuit priests, were convicted of conspiracy and trespass in Tacoma, US. They cut fences at Naval Base Kitsap-Bangor in 2009 to protest submarine nuclear weapons, and reached an area near where Trident nuclear warheads are stored in bunkers. Members of the group could face up to 10 years in prison. In January 2011, five Japanese young people held a hunger strike for more than a week, outside the Prefectural Government offices in Yamaguchi City, to protest against the planned Kaminoseki Nuclear Power Plant near the environmentally sensitive Seto Inland Sea. 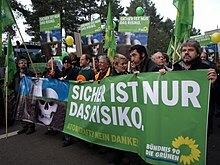 Following the Fukushima Daiichi nuclear disaster, anti-nuclear opposition intensified in Germany. On 12 March 2011, 60,000 Germans formed a 45-km human chain from Stuttgart to the Neckarwestheim power plant. On 14 March, 110,000 people protested in 450 other German towns, with opinion polls indicating 80% of Germans opposed the government's extension of nuclear power. On March 15, 2011, Angela Merkel said that seven nuclear power plants which went online before 1980 would be closed and the time would be used to study speedier renewable energy commercialization. In March 2011, around 2,000 anti-nuclear protesters demonstrated in Taiwan for an immediate halt to the construction of the island's fourth nuclear power plant. The protesters were also opposed to plans to extend the lifespan of three existing nuclear plants. In March 2011, more than 200,000 people took part in anti-nuclear protests in four large German cities, on the eve of state elections. Organisers called it the largest anti-nuclear demonstration the country has seen. Thousands of Germans demanding an end to the use of nuclear power took part in nationwide demonstrations on 2 April 2011. About 7,000 people took part in anti-nuclear protests in Bremen. About 3,000 people protested outside RWE's headquarters in Essen. Citing the Fukushima nuclear disaster, environmental activists at a U.N. meeting in April 2011 "urged bolder steps to tap renewable energy so the world doesn't have to choose between the dangers of nuclear power and the ravages of climate change". In mid-April, 17,000 people protested at two demonstrations in Tokyo against nuclear power. In India, environmentalists, local farmers and fishermen have been protesting for months over the planned Jaitapur Nuclear Power Project six-reactor complex, 420 km south of Mumbai. If built, it would be one of the world's largest nuclear power complexes. Protests have escalated following Japan's Fukushima nuclear disaster and during two days of violent rallies in April 2011, a local man was killed and dozens were injured. In May 2011, some 20,000 people turned out for Switzerland's largest anti-nuclear power demonstration in 25 years. Demonstrators marched peacefully near the Beznau Nuclear Power Plant, the oldest in Switzerland, which started operating 40 years ago. Days after the anti-nuclear rally, Cabinet decided to ban the building of new nuclear power reactors. The country's five existing reactors would be allowed to continue operating, but "would not be replaced at the end of their life span". In May 2011, 5,000 people joined a carnival-like anti-nuclear protest in Taipei City. This was part of a nationwide “No Nuke Action” protest, urging the government to stop construction of a Fourth Nuclear Plant and pursue a more sustainable energy policy. On World Environment Day in June 2011, environmental groups demonstrated against Taiwan's nuclear power policy. The Taiwan Environmental Protection Union, together with 13 environmental groups and legislators, gathered in Taipei and protested against the nation's three operating nuclear power plants and the construction of a fourth plant. Three months after the Fukushima nuclear disaster, thousands of anti-nuclear protesters marched in Japan. Company workers, students, and parents with children rallied across Japan, "venting their anger at the government's handling of the crisis, carrying flags bearing the words 'No Nukes!' and 'No More Fukushima'." In August 2011, about 2,500 people including farmers and fishermen marched in Tokyo. They are suffering heavy losses following the Fukushima nuclear disaster, and called for prompt compensation from plant operator TEPCO and the government. 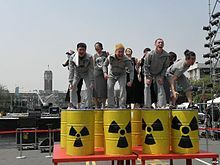 In September 2011, anti-nuclear protesters, marching to the beat of drums, "took to the streets of Tokyo and other cities to mark six months since the March earthquake and tsunami and vent their anger at the government's handling of the nuclear crisis set off by meltdowns at the Fukushima power plant". Protesters called for a complete shutdown of Japanese nuclear power plants and demanded a shift in government policy toward alternative sources of energy. Among the protestors were four young men who started a 10-day hunger strike to bring about change in Japan's nuclear policy. Tens of thousands of people marched in central Tokyo in September 2011, chanting "Sayonara nuclear power" and waving banners, to call on Japan's government to abandon atomic energy in the wake of the Fukushima nuclear disaster. Author Kenzaburō Ōe and musician Ryuichi Sakamoto were among the event's supporters. Since the March 2011 Japanese Fukushima nuclear disaster, "populations around proposed Indian NPP sites have launched protests that are now finding resonance around the country, raising questions about atomic energy as a clean and safe alternative to fossil fuels". Assurances by Prime Minister Manmohan Singh that all safety measures will be implemented, have not been heeded, and there have thus been mass protests against the French-backed 9900 MW Jaitapur Nuclear Power Project in Maharashtra and the 2000 MW Koodankulam Nuclear Power Plant in Tamil Nadu. The state government of West Bengal state has also refused permission to a proposed 6000 MW facility where six Russian reactors were to be built. A Public Interest Litigation (PIL) has also been filed against the government's civil nuclear program at the apex Supreme Court. The PIL specifically asks for the "staying of all proposed nuclear power plants till satisfactory safety measures and cost-benefit analyses are completed by independent agencies". Michael Banach, the current Vatican representative to the International Atomic Energy Agency, told a conference in Vienna in September 2011 that the Japanese nuclear disaster created new concerns about the safety of nuclear plants globally. Auxiliary bishop of Osaka Michael Goro Matsuura said this serious nuclear power incident should be a lesson for Japan and other countries to abandon nuclear projects. He called on the worldwide Christian solidarity to provide wide support for this anti-nuclear campaign. Statements from bishops’ conferences in Korea and the Philippines called on their governments to abandon atomic power. Nobel laureate Kenzaburō Ōe has said Japan should decide quickly to abandon its nuclear reactors. In the UK, in October 2011, more than 200 protesters blockaded the Hinkley Point C nuclear power station site. Members of the Stop New Nuclear alliance barred access to the site in protest at EDF Energy's plans to build two new reactors on the site. Thousands of demonstrators took to the streets of Yokohama, Japan, on January 14–15, 2012, to show their support for a nuclear power-free world. The demonstration showed that organized opposition to nuclear power has gained momentum following the Fukushima nuclear disaster. The most immediate demand of the demonstrators was for the protection of rights, including basic human rights such as health care, for those affected by the Fukushima accident. In January 2012, three hundred anti-nuclear protestors marched against plans to build a new nuclear power station at Wylfa in the UK. The march was organised by Pobl Atal Wylfa B, Greenpeace and Cymdeithas yr Iaith, which are supporting a farmer who is in dispute with Horizon. On the anniversary of the 11 March earthquake and tsunami, protesters across Japan called for the abolishment of nuclear power and nuclear reactors. In Koriyama, Fukushima, 16,000 people called for the end of nuclear power. In Shizuoka Prefecture, 1,100 people appealed for the scrapping of the Hamaoka Nuclear Power Plant. In Tsuruga, Fukui, 1,200 people marched in the streets of the city of Tsuruga, the home of the Monju fast-breeder reactor prototype and other nuclear reactors. In Nagasaki and Hiroshima, anti-nuclear protesters and atomic-bomb survivors marched together and demanded that Japan should end its nuclear dependency. Austrian Chancellor Werner Faymann expects anti-nuclear petition drives to start in at least six European Union countries in 2012 in an effort to have the EU abandon nuclear power. Under the EU's Lisbon Treaty, petitions that attract at least one million signatures can seek legislative proposals from the European Commission, which would pave the way for anti-nuclear activists to garner support. In March 2012, about 2,000 people staged an anti-nuclear protest in Taiwan's capital following the massive tsunami that hit Japan one year ago. The protesters rallied in Taipei to renew calls for a nuclear-free island. They "want the government to scrap a plan to operate a newly constructed nuclear power plant – the fourth in densely populated Taiwan". Scores of aboriginal protesters "demanded the removal of 100,000 barrels of nuclear waste stored on their Orchid Island". In March 2012, hundreds of anti-nuclear demonstrators converged on the Australian headquarters of global mining giants BHP Billiton and Rio Tinto. The 500-strong march through southern Melbourne called for an end to uranium mining in Australia, and included speeches and performances by representatives of the expatriate Japanese community as well as Australia's Indigenous communities, who are concerned about the effects of uranium mining near tribal lands. There were also events in Sydney. In March 2012, South Korean environmental groups held a rally in Seoul to oppose nuclear power. Over 5,000 people attended, and the turnout was one of the largest in recent memory for an anti-nuclear rally. The demonstration demanded that President Lee Myung Bak abandon his policy of promoting nuclear power. In March 2012, police said they had arrested nearly 200 anti-nuclear activists who were protesting the restart of work at the long-stalled Indian Kudankulam nuclear power plant. In June 2012, tens of thousands of Japanese protesters participated in anti-nuclear power rallies in Tokyo and Osaka, over the government's decision to restart the first idled reactors since the Fukushima disaster, at Oi Nuclear Power Plant in Fukui Prefecture. Thousands of protesters marched in Tokyo on March 11, 2013 calling on the government to reject nuclear power. In March 2013, 68,000 Taiwanese protested across major cities against nuclear power and the island's fourth nuclear plant, which is under construction. Taiwan's three existing nuclear plants are near the ocean, and prone to geological fractures, under the island. In April 2013, thousands of Scottish campaigners, MSPs, and union leaders, rallied against nuclear weapons. The Scrap Trident Coalition wants to see an end to nuclear weapons, and says saved monies should be used for health, education and welfare initiatives. There was also a blockade of the Faslane Naval Base, where Trident missiles are stored. In March 2014, around 130,000 Taiwanese marched for an anti-nuclear protest around Taiwan. They demanded that the government remove nuclear power plants in Taiwan. The march came ahead of the 3rd anniversary of Fukushima disaster. Around 50,000 people marched in Taipei while another three separate events were held around other Taiwanese cities attended by around 30,000 people. Among the participants are the organizations from Green Citizen Action's Alliance, Homemakers United Foundation, Taiwan Association for Human Rights and Taiwan Environmental Protection Union. Facing on-going opposition and a host of delays, construction of the Lungmen Nuclear Power Plant was halted in April 2014. On 10 July 1985, the flagship of Greenpeace, Rainbow Warrior, was sunk by French agents in New Zealand waters, and a Greenpeace photographer was killed. The ship was involved in protests against nuclear weapons testing at Mururoa Atoll. The French Government initially denied any involvement with the sinking but eventually admitted its guilt in October 1985. Two French agents pleaded guilty to charges of manslaughter, and the French Government paid $7 million in damages. In 1990, two pylons holding high-voltage power lines connecting the French and Italian grid were blown up by Italian eco-terrorists, and the attack is believed to have been directly in opposition against the Superphénix. In 2004, activist Sébastien Briat, who had tied himself to train tracks in front of a shipment of reprocessed nuclear waste, was run over by the wheels of the train. The event happened in Avricourt, France, and the fuel (totaling 12 containers) was from a German plant, on its way to be reprocessed. Beginning in the 1950s, anti-nuclear ideas received coverage in the popular media with novels such as Fail-Safe and feature films such as Godzilla (1954),Dr. Strangelove or: How I Learned to Stop Worrying and Love the Bomb (1964), The China Syndrome (1979), Silkwood (1983), and The Rainbow Warrior (1992). Dr. Strangelove explored "what might happen within the Pentagon ... if some maniac Air Force general should suddenly order a nuclear attack on the Soviet Union". One reviewer called the movie "one of the cleverest and most incisive satiric thrusts at the awkwardness and folly of the military that has ever been on the screen". The China Syndrome has been described as a "gripping 1979 drama about the dangers of nuclear power" which had an extra impact when the real-life accident at the Three Mile Island nuclear plant occurred several weeks after the film opened. Jane Fonda plays a TV reporter who witnesses a near-meltdown (the "China syndrome" of the title) at a local nuclear plant, which was averted by a quick-thinking engineer, played by Jack Lemmon. The plot suggests that corporate greed and cost-cutting "have led to potentially deadly faults in the plant's construction". Silkwood was inspired by the true-life story of Karen Silkwood, who died in a suspicious car accident while investigating alleged wrongdoing at the Kerr-McGee plutonium plant where she worked. Dark Circle is a 1982 American documentary film that focuses on the connections between the nuclear weapons and the nuclear power industries, with a strong emphasis on the individual human and protracted U.S. environmental costs involved. A clear point made by the film is that while only two bombs were dropped on Japan, many hundreds were exploded in the United States. The film won the Grand Prize for documentary at the Sundance Film Festival and received a national Emmy Award for "Outstanding individual achievement in news and documentary." For the opening scenes and about half of its length, the film focuses on the Rocky Flats Plant and its plutonium contamination of the area's environment. Ashes to Honey (ミツバチの羽音と地球の回転, Mitsubashi no haoto to chikyū no kaiten), (literally "Humming of Bees and Rotation of the Earth") is a Japanese documentary directed by Hitomi Kamanaka and released in 2010. It is the third in Kamanaka's trilogy of films on the problems of nuclear power and radiation, preceded by Hibakusha at the End of the World (also known as Radiation: A Slow Death) and Rokkasho Rhapsody. Nuclear Tipping Point is a 2010 documentary film produced by the Nuclear Threat Initiative. It features interviews with four American government officials who were in office during the Cold War period, but are now advocating for the elimination of nuclear weapons. They are: Henry Kissinger, George Shultz, Sam Nunn, and William Perry. Musicians United for Safe Energy (MUSE) was a musical group founded in 1979 by Jackson Browne, Graham Nash, Bonnie Raitt, and John Hall, following the Three Mile Island nuclear accident. The group organized a series of five No Nukes concerts held at Madison Square Garden in New York City in September 1979. On September 23, 1979, almost 200,000 people attended a large anti-nuclear rally staged by MUSE on the then-empty north end of the Battery Park City landfill in New York. The album No Nukes, and a film, also titled No Nukes, were both released in 1980 to document the performances. In 2007, Bonnie Raitt, Graham Nash, and Jackson Browne, as part of the No Nukes group, recorded a music video of the Buffalo Springfield song "For What It's Worth". Filmmakers Taylor Dunne and Eric Stewart are working on a documentary called “Off country” that looks at the devastating effects of atomic bomb testing on the communities around the White Sands missile range in New Mexico, the Nevada Test Site and the Rocky Flats Plant in Colorado. They were interviewed by Screen Comment's Sam Weisberg in 2017. The Bulletin of the Atomic Scientists is a nontechnical online magazine that has been published continuously since 1945, when it was founded by former Manhattan Project physicists after the atomic bombings of Hiroshima and Nagasaki. The Bulletin's primary aim is to inform the public about nuclear policy debates while advocating for the international control of nuclear weapons. One of the driving forces behind the creation of the Bulletin was the amount of public interest surrounding atomic energy at the dawn of the atomic age. In 1945 the public interest in atomic warfare and weaponry inspired contributors to the Bulletin to attempt to inform those interested about the dangers and destruction that atomic war could bring about. In the 1950s, the Bulletin was involved in the formation of the Pugwash Conferences on Science and World Affairs, annual conferences of scientists concerned about nuclear proliferation. Historian Lawrence S. Wittner has argued that anti-nuclear sentiment and activism led directly to government policy shifts about nuclear weapons. Public opinion influenced policymakers by limiting their options and also by forcing them to follow certain policies over others. Wittner credits public pressure and anti-nuclear activism with "Truman’s decision to explore the Baruch Plan, Eisenhower’s efforts towards a nuclear test ban and the 1958 testing moratorium, and Kennedy’s signing of the Partial Test Ban Treaty". In terms of nuclear power, Forbes magazine, in the September 1975 issue, reported that "the anti-nuclear coalition has been remarkably successful ... [and] has certainly slowed the expansion of nuclear power." California has banned the approval of new nuclear reactors since the late 1970s because of concerns over waste disposal, and some other U.S. states have a moratorium on construction of nuclear power plants. Between 1975 and 1980, a total of 63 nuclear units were canceled in the United States. Anti-nuclear activities were among the reasons, but the primary motivations were the overestimation of future demand for electricity and steadily increasing capital costs, which made the economics of new plants unfavorable. The proliferation of nuclear weapons became a presidential priority issue for the Carter Administration in the late 1970s. To deal with proliferation problems, President Carter promoted stronger international control over nuclear technology, including nuclear reactor technology. Although a strong supporter of nuclear power generally, Carter turned against the breeder reactor because the plutonium it produced could be diverted into nuclear weapons. For many years after the 1986 Chernobyl disaster nuclear power was off the policy agenda in most countries. In recent years, intense public relations activities by the nuclear industry, increasing evidence of climate change and failures to address it, have brought nuclear power issues back to the forefront of policy discussion in the nuclear renaissance countries. But some countries are not prepared to expand nuclear power and are still divesting themselves of their nuclear legacy, through nuclear power phase-out legislation. Under the New Zealand Nuclear Free Zone, Disarmament, and Arms Control Act 1987, all territorial sea and land of New Zealand is declared a nuclear free zone. Nuclear-powered and nuclear-armed ships are prohibited from entering the country's territorial waters. Dumping of foreign radioactive waste and development of nuclear weapons in the country is outlawed. Despite common misconception, this act does not make nuclear power plants illegal, nor does it make radioactive medical treatments produced in overseas reactors illegal. A 2008 survey shows that 19% of New Zealanders favour nuclear power as the best energy source, while 77% prefer wind power as the best energy source. On 26 February 1990, FW de Klerk issued orders to terminate the country's nuclear weapons programme, which until then had been a state secret. South Africa becomes the first country in the world to voluntary give-up its nuclear weapons programme. Ireland, in 1999, had no plans to change its non-nuclear stance and pursue nuclear power in the future. In the United States, the Navajo Nation forbids uranium mining and processing in its land. 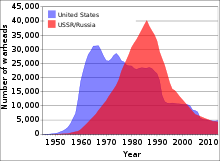 In the United States, a 2007 University of Maryland survey showed that 73 percent of the public surveyed favours the elimination of all nuclear weapons, 64 percent support removing all nuclear weapons from high alert, and 59 percent support reducing U.S. and Russian nuclear stockpiles to 400 weapons each. Given the unpopularity of nuclear weapons, U.S. politicians have been wary of supporting new nuclear programs. Republican-dominated congresses "have defeated the Bush administration's plan to build so-called 'bunker-busters' and 'mini-nukes'." The Megatons to Megawatts Program converts weapons-grade material from nuclear warheads into fuel for nuclear power plants. Today, some 26,000 nuclear weapons remain in the arsenals of the nine nuclear powers, with thousands on hair-trigger alert. Although U.S., Russian, and British nuclear arsenals are shrinking in size, those in the four Asian nuclear nations—China, India, Pakistan, and North Korea—are growing, in large part because of tensions among them. This Asian arms race also has possibilities of bringing Japan into the nuclear club. During Barack Obama's successful U.S. presidential election campaign, he advocated the abolition of nuclear weapons. Since his election he has reiterated this goal in several major policy addresses. In 2010, the Obama administration negotiated a new weapons accord with Russia for a reduction of the maximum number of deployed nuclear weapons on each side from 2,200 to between 1,500 and 1,675—a reduction of some 30 percent. In addition, President Obama has committed $15 billion over the next five years to improving the safety of the nuclear weapons stockpile. Following the Fukushima Daiichi nuclear disaster, the Italian government put a one-year moratorium on plans to revive nuclear power. On 11–12 June 2011, Italian voters passed a referendum to cancel plans for new reactors. Over 94% of the electorate voted in favor of the construction ban, with 55% of the eligible voters participating, making the vote binding. German Chancellor Angela Merkel's coalition announced on May 30, 2011, that Germany's 17 nuclear power stations will be shut down by 2022, in a policy reversal following Japan's Fukushima I nuclear accidents and anti-nuclear protests within Germany. Seven of the German power stations were closed temporarily in March, and they will remain off-line and be permanently decommissioned. An eighth was already off line, and will stay so. As of 2011, countries such as Australia, Austria, Denmark, Greece, Ireland, Italy, Latvia, Liechtenstein, Luxembourg, Malta, Portugal, Israel, Malaysia, New Zealand, and Norway remain opposed to nuclear power. Germany and Switzerland are phasing-out nuclear power. In 2005, the International Atomic Energy Agency presented the results of a series of public opinion surveys in the Global Public Opinion on Nuclear Issues report. Majorities of respondents in 14 of the 18 countries surveyed believe that the risk of terrorist acts involving radioactive materials at nuclear facilities is high, because of insufficient protection. While majorities of citizens generally support the continued use of existing nuclear power reactors, most people do not favour the building of new nuclear plants, and 25% of respondents feel that all nuclear power plants should be closed down. Stressing the climate change benefits of nuclear energy positively influences 10% of people to be more supportive of expanding the role of nuclear power in the world, but there is still a general reluctance to support the building of more nuclear power plants. Stewart Brand at a 2010 debate, "Does the world need nuclear energy?" Attempts to reach political agreement on effective policies for climate change continue, and pro-nuclear environmentalists seek to reverse the traditionally anti-nuclear attitudes of environmentalists. Filmmaker Rob Stone's Pandora's Promise (2013) is a good example of this trend. Some environmentalists criticise the anti-nuclear movement for under-stating the environmental costs of fossil fuels and non-nuclear alternatives, and overstating the environmental costs of nuclear energy. Of the numerous nuclear experts who have offered their expertise in addressing controversies, Bernard Cohen, Professor Emeritus of Physics at the University of Pittsburgh, is likely the most frequently cited. In his extensive writings he examines the safety issues in detail. He is best known for comparing nuclear safety to the relative safety of a wide range of other phenomena. Anti-nuclear activists are accused of encouraging radiophobic emotions among the public. The War Against the Atom (Basic Books, 1982) Samuel MacCracken of Boston University argued that in 1982, 50,000 deaths per year could be attributed directly to non-nuclear power plants, if fuel production and transportation, as well as pollution, were taken into account. He argued that if non-nuclear plants were judged by the same standards as nuclear ones, each US non-nuclear power plant could be held responsible for about 100 deaths per year. The Nuclear Energy Institute (NEI) is the main lobby group for companies doing nuclear work in the United States, while most countries that employ nuclear energy have a national industry group. The World Nuclear Association is the only global trade body. In seeking to counteract the arguments of nuclear opponents, it points to independent studies that quantify the costs and benefits of nuclear energy and compares them to the costs and benefits of alternatives. NEI sponsors studies of its own, but it also references studies performed for the World Health Organization, for the International Energy Agency, and by university researchers. Critics of the anti-nuclear movement point to independent studies that show that the capital resources required for renewable energy sources are higher than those required for nuclear power. Some people, including former opponents of nuclear energy, criticise the movement on the basis of the claim that nuclear power is necessary for reducing carbon dioxide emissions. These individuals include James Lovelock, originator of the Gaia hypothesis, Patrick Moore, a co-founder of Greenpeace and former director of Greenpeace International, George Monbiot and Stewart Brand, creator of the Whole Earth Catalog. Lovelock goes further to refute claims about the danger of nuclear energy and its waste products. In a January 2008 interview, Moore said that "It wasn't until after I'd left Greenpeace and the climate change issue started coming to the forefront that I started rethinking energy policy in general and realised that I had been incorrect in my analysis of nuclear as being some kind of evil plot." Some anti-nuclear organisations have acknowledged that their positions are subject to review. In April 2007, Dan Becker, Director of Global Warming for the Sierra Club, declared, "Switching from dirty coal plants to dangerous nuclear power is like giving up smoking cigarettes and taking up crack." James Lovelock criticizes holders of such a view: "Opposition to nuclear energy is based on irrational fear fed by Hollywood-style fiction, the Green lobbies and the media." ". . .I am a Green and I entreat my friends in the movement to drop their wrongheaded objection to nuclear energy." George Monbiot, an English writer known for his environmental and political activism, once expressed deep antipathy to the nuclear industry. He finally rejected his later neutral position regarding nuclear power in March 2011. Although he "still loathe[s] the liars who run the nuclear industry", Monbiot now advocates its use, having been convinced of its relative safety by what he considers the limited effects of the 2011 Japan tsunami on nuclear reactors in the region. Subsequently, he has harshly condemned the anti-nuclear movement, writing that it "has misled the world about the impacts of radiation on human health ... made [claims] ungrounded in science, unsupportable when challenged and wildly wrong." He singled out Helen Caldicott for, he wrote, making unsourced and inaccurate claims, dismissing contrary evidence as part of a cover-up, and overstating the death toll from the Chernobyl disaster by a factor of more than 140. ^ M.V. Ramana (July 2011). "Nuclear power and the public". Bulletin of the Atomic Scientists. 67 (4): 44. doi:10.1177/0096340211413358. ^ Mark Cooper (July 2011). "The implications of Fukushima: The US perspective". Bulletin of the Atomic Scientists. 67 (4): 9. doi:10.1177/0096340211414840. ^ M. V. Ramana (July 2011). "Nuclear power and the public". Bulletin of the Atomic Scientists. 67 (4): 47–48. doi:10.1177/0096340211413358. ^ M.V. Ramana (July 2011). "Nuclear power and the public". Bulletin of the Atomic Scientists. 67 (4): 46. doi:10.1177/0096340211413358. ^ M. V. Ramana (July 2011). "Nuclear power and the public". Bulletin of the Atomic Scientists. 67 (4): 48. doi:10.1177/0096340211413358. ^ W Wayt Gibbs (30 December 2013). "Triple-threat method sparks hope for fusion". Nature. 505 (7481): 9–10. doi:10.1038/505009a. ^ Cartlidge, E. (2011). "Saving for a Rainy Day". Science. 334 (6058): 922–924. doi:10.1126/science.334.6058.922. ^ Clack, Christopher T. M.; Qvist, Staffan A.; Apt, Jay; Bazilian, Morgan; Brandt, Adam R.; Caldeira, Ken; Davis, Steven J.; Diakov, Victor; Handschy, Mark A. (27 June 2017). "Evaluation of a proposal for reliable low-cost grid power with 100% wind, water, and solar". Proceedings of the National Academy of Sciences. 114 (26): 6722–6727. Bibcode:2017PNAS..114.6722C. doi:10.1073/pnas.1610381114. ISSN 0027-8424. PMC 5495221. PMID 28630353. ^ Diane Farseta (1 September 2008). "The Campaign to Sell Nuclear". Bulletin of the Atomic Scientists. 64 (4): 38–56. doi:10.2968/064004009. ^ a b William A. Gamson and Andre Modigliani. Media Coverage and Public Opinion on Nuclear Power[permanent dead link], American Journal of Sociology, Vol. 95, No. 1, July 1989, p. 15.